I’d put off rafting the famous Middle Ocoee for years. Just the look of it spitting rafts and kayaks down what looked like a continuous hellstorm of whitewater rage had kept me away, on calmer waters. Now that I had a friend—David Wilburn—who had guided rafts down the Ocoee for 27 years, I really had no excuse for putting it off any longer. On the Saturday before Memorial Day, I found myself in a bus with Wilburn and the other guides, careening downhill toward the put-in. A bluegrass cover of Pink Floyd’s “Another Brick in the Wall” blared over the rush of the wind through the open windows. Everything was at high volume: the merciless taunts aimed at Smoot, the driver; his withering comebacks; what seemed like a dozen shouted conversations at once, though there were only ten of us in the short bus. These people were going to work and they were celebrating it. At the slackwater above the dam, we unloaded the nine rafts and waited for the customers to arrive in another bus, with life jackets, paddles, and helmets provided by the outfitter, Ocoee Outdoors (“double O”), “Tennessee’s #1 outfitter since 1977,” according to its brochure. The parking lot above the dam was jammed with buses from several other rafting companies. Where we waited with our rafts, boaters were taking out from the upper run, where the whitewater slalom events of the 1996 Olympics had been held. Wilburn and I would take on three crew members—Sunshine, a guide trainee; and Shondra and Rob from Savannah. 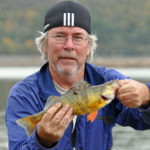 Rob had rafted the upper Ocoee some years previous and had taken a bad “swim” that cracked a rib. I had rafted several times before—and had swum part of the French Broad’s Section 9—so I sympathized. Guide safety lectures are usually a mixture of commonsense advice and dark humor, designed to inspire confidence in the guide’s expertise and wit, as well as respect for the river. It’s a fine line between educating passengers about dangers and imploring them to have fun regardless. We paddled a few hundred yards and portaged around the dam, where we waited in line with dozens of other rafters and kayakers. On the other side of the river was a flume, where TVA’s scheduled releases supplied the water for runs between the end of March and the beginning of November. The Middle Ocoee includes 20 named rapids in 5 miles, a run of about two hours. The action started immediately after the put-in with Grumpy’s Ledge, where, David told us, we did not want to swim, his way of telling us to “brace,” feet tucked tight in the seam between the raft’s thwarts and the floor. 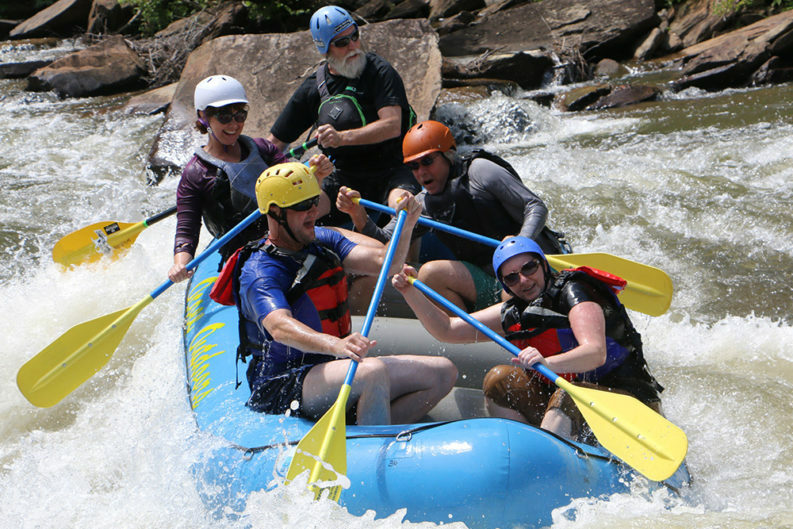 You will get wet from the start on the Ocoee, and like a cold shower, it will awaken you to what you’ve signed up for. Wilburn told me that anything can happen on the river, that it’s never routine. He estimated that he’d done around 500 commercial runs with Double O, but the one he guided the previous July was, I’d guess, his most memorable. After “Broken Nose” rapid, the fourth one in, he’d begun having chest pains, but he thought he’d just pulled a muscle and didn’t want to admit to himself that it might be something more serious. By Jump Rock, where all the boats had stopped, the pain worsened and he told the other guides he thought he was having a heart attack. Wilburn credits the quick action and expertise of the other guides (all trained in CPR and first aid, many trained as first responders), as well as a nurse who was a passenger in another boat, with saving his life. They got him across the river to the road, where they waited for the ambulance. He said he lay there under the trees listening to somebody say they couldn’t find a pulse, and he raised his head to inform them that he was still alive. “I remember thinking that if I had to go, this wouldn’t be a bad place, here by the river on such a pretty day,” he said. A year later, 40 pounds lighter, Wilburn was back at it. Our trip was his second commercial run since the heart attack. Between historical observations and instructions before each rapid, Wilburn told us stories. There was the “unbuoyant” preacher from Memphis who fell out and “floated straight up and down” in the water, his life jacket riding up above his head, both arms raised up straight out of the water, praying aloud to Jesus before Wilburn could catch up to him and get him back into the boat. There was the Japanese group who spoke hardly any English, who would only nod and smile when Wilburn told them to paddle, except one guy who paddled forward, no matter what Wilburn’s instructions, and then backward at the next command, no matter the order. “Their kids were in another boat and did fine,” he said. 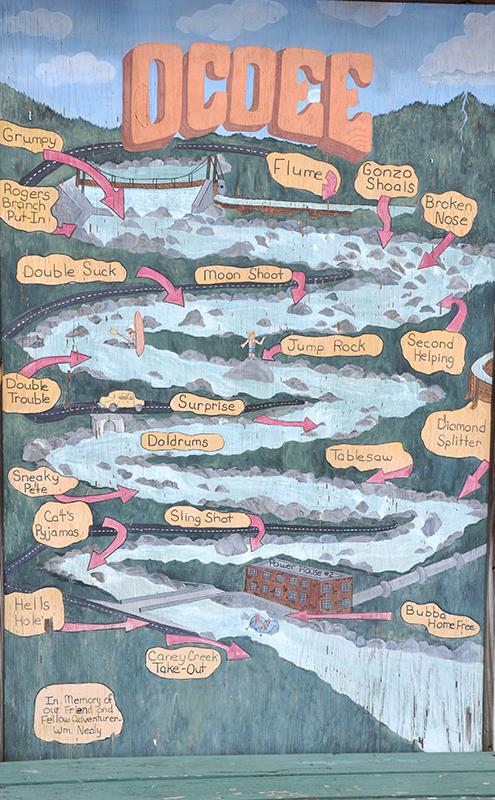 I’ve always been amazed at the multifaceted nature of the rafting guide’s job. Not only are they expected to deliver customers safe and sound to the takeout, they’re expected to entertain. They’ve got to tend to the ailing, rally the disaffected, control the unruly, and spur to action the “lily dippers,” whose paddle strokes are lacking in commitment. At the head of a rapid called “Slingshot,” Wilburn told Rob and Sunshine, on the right side of the raft, to turn around backwards in their seats and paddle forward, while Shondra and I, on the left side, paddled forward in the opposite direction. I’m not sure what Wilburn was doing behind me, but we did a series of 360-degree spins through Slingshot, reminding me of the old carnival ride, the Tilt-a-Whirl. Some of the rapids’ names were fairly literal—like Double Trouble—or darkly mysterious, like the Cat’s Pajamas, where Wilburn said that a child’s pajamas with cats imprinted on them was found. “Tablesaw” and “Hell’s Hole,” coming up, inspired abject dread in a pilgrim rafter like me. In spite of my confidence in Wilburn’s skills, I was horrified by the shitstorm of whitewater ahead of us. It looked impassable, but there was no turning back. The raft folded and pitched and bounced us around, and Wilburn urged us on to paddle as he steered us through it, only to be greeted almost immediately by “Diamond Splitter,” a narrow passage between two boulders, with something called Witches Hole below it. We came to Hell’s Hole just upstream of the powerhouse, below a bridge where spectators stood. “We’ll probably catch some air on this one,” Sunshine said. “Catching air” means rising out of your seat from the G-forces of our passage through Hell. We folded and we bucked, but Hell’s Hole spit us back into the world intact. I looked back and asked Wilburn if that was a Class IV (on the International Scale of River Difficulty that goes from I to VI), as I’d asked him after Tablesaw and Maypop. “Nah, three” he’d said each time. At the end, as we paddled toward the takeout, he conceded that he might have called Hell’s Hole a Class IV back in the time before self-bailing rafts. Whatever the class, it had my heart pounding, even though I’d only been a passenger, doing what I’d been told. What we’d experienced in that boat, I’m convinced, was an immaculate run.